By lavender at Jul. 3. 2014. Yellow peonies are not a new phenomenon. The Chinese have cultivated and prized this unusually colored peony for centuries. Yellow peony flowers have always existed as tree peonies. The yellow color was not previously available in herbaceous bush peonies, which were only found in the more conventionally peony shades of white, pink and red. Tree peonies are more of a woody stemmed bush than a tree. They are very slow to establish themselves; although undisturbed they can last and continue to bloom for as long as a hundred years. It takes a full five years for a tree peony to bloom from seed. In some varieties it can take another 5 to 8 years to stabilize flower color and form. A twenty five year old tree peony is considered a young plant. So, if you wanted a yellow peony you had to be prepared to wait patiently for a slowly maturing plant to become fully established. In the 1940’s Toichi Itoh, began a breeding program to cross the tree peony with the herbaceous peony to produce a yellow bush peony. This was not an easy task, as the plants are not that closely related genetically. Eventually, he produced 36 seedlings from a cross of Paeonia x lemoinei, a hybrid tree peony, with P. lactiflora ‘Kakoden’, a bush peony with white flowers. It was 1964 before his crosses began to bloom and by that time Ioth was long dead. His widow was content to let them bloom in his garden and they would have been lost to the gardening world if an American horticulturist, Louis Smirnow, had not found them and obtained permission to patent them. He chose 4 of the plants that all had deep yellow, double flowers on herbaceous plants and imported them to the US. These were the first intersectional peonies and were marketed under the names ‘Yellow Crown, ‘Yellow Dream’, ‘Yellow Emperor’ and ‘Yellow Heaven’. These peonies were difficult to grow, slow to bloom and consequently difficult to find and expensive. They were definitely not found in the average garden. Breeders such as Don Smith, Don Hollingsworth, Irene Tolomeo and Bill Seidl took up the challenge. The best of the hybridizers was Roger Anderson of Fort Akinson, Wisconsin. He produced the peony that is now known as ‘Bartzella’. It took 12 years of patient work to get a viable cross. In 1980 the seeds were planted and it was another 6 years before the plant bloomed. 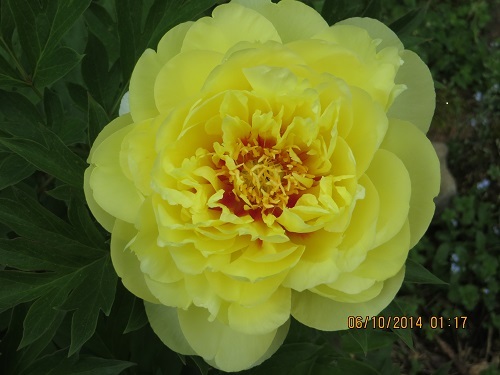 ‘Bartzella’ is a bright yellow peony with a red center. The flowers are semi-double to fully double and range from between 6 to 9 inches across. My bush produced 1 flower this year but the plant should become more productive as it ages. The one in my yard was put in last summer. Bartzella seems to have some of the slow flowering habits of the tree peony. The flower on my bush was fully double and 7 inches across when in full bloom. The rain shattered it, while a pink peony beside it remained unscathed. The stem on the yellow peony is shorter and doesn’t bend as do the stems on the regular herbaceous peony. This makes staking unnecessary but the flower is subjected to the full force of rain and wind. The pink peony is now facing the ground but intact. To be fair, the yellow peony flower was a few days older than the pink peonies. Flowering time is late spring to early summer. The flowers have a fragrance that is described as “spicy” or “lemony”. Personally, I find the odor rather unpleasant. If the odor is spicy it is some exotic spice with mustiness to it. Lemony is just delusional probably inspired by the color. The plant itself is very similar to a bush peony. It reaches a height of 3 feet and should have a similar spread. My plant, which was bought potted is, about that height with an approximately 18 inch spread. It is about half again as big as it was last summer when planted. It is considered to be a slow grower and rarely needs to be divided after reaching its maximum spread. Dividing should be done in the fall when deemed necessary or for propagation. Leaves are dark green and more finely divided than bush peonies. They are said to hold up well into the fall. The plant will die back to the ground and should be cut off nearly to the ground as is done with a bush peony. Hardiness zones on Bartzella are 4-8. The plant will tolerate most soils but prefers good drainage. It does best in full sun. The deer do not usually bother peonies. One caution though, peonies will not bloom if planted too deep. They should be planted at the level of the pot when purchased as a container plant. If planting bare root stock, place the eyes 1 ½ to 2 inches below the soil surface. In warmer climates they should be planted even more shallowly. Intersectional peonies are still not easy to find and they are expensive. ‘Bartzella’, which won the American Peony Society Gold Medal, was allegedly selling for $1000 when it was first introduced. A well grown plant will cost anywhere from $60 to $100. Smaller bare root sections can be had for between $25 and $30. However, sometimes we get lucky. I picked up a potted ‘Bartzella’ last year in State College for under $40. Some of the plants were in bloom but they were sold by the time I bought mine. Some of the intersectionals that are not as popular can be had for lesser prices but they are not being sold at the prices of run of the mill perennials. And then sometimes you just get lucky. At the end of the season last year Lowe’s put on sale some boxed bare root intersectional peonies that were originally $30 for $7. Of course a lot of them were dried up and probably not viable but I did find one called ‘Canary Brilliants’ that seemed plumb with nice healthy eyes. This is one that came from Robert Anderson’s breeding program. It isn’t any taller than “Bartzella’ but it has a spread of 48 inches. At 32 inches in height it is considered a dwarf. The stems are reddish and the leaves have pinkish margins. It is a very pretty plant and apparently very hardy as it made it through the winter despite its small size. It didn’t bloom this year and I suspect it will be a couple of more years before I see a flower. The flower supposedly opens a taupe color and then brightens to yellow with a coral center. The blooms are supposed to be longer lasting than normal peonies. From what I’ve seen of the growth of these two yellow peonies the prices should be moderating soon. They seem to be easy to grow and increase in size at a very satisfactory rate. The deer decimated my Batzellas! They have never touched my other peonies but certainly have a taste for these. Deer are peculiar. They are individual in their appetites and what most dislike there will often be a deer or two that find it palatable. Also, they are curious and will nibble anything new in the landscape. Flowers and roots of peonies are poisonous but apparently the leaves are harmless. I’ve been told that deer are less likely to eat regular peonies than they are to eat tree peonies so maybe this cross is tastier than the normal peony. I’ve had them eat the leaves of a new hybrid peony but they never touch the larger old fashioned ones that are much more accessible in my yard.